Paintings Prints and Stuff, a blog about painting, drawing, sketching, sketchbooks, works in progress, artists, exhibitions, art books, art classes, printmaking, digital imagery, techniques, art materials ........... and more! .... ok ... disorganised as usual. I'm nearly there :) thanks in part to Amazon and Ebay! 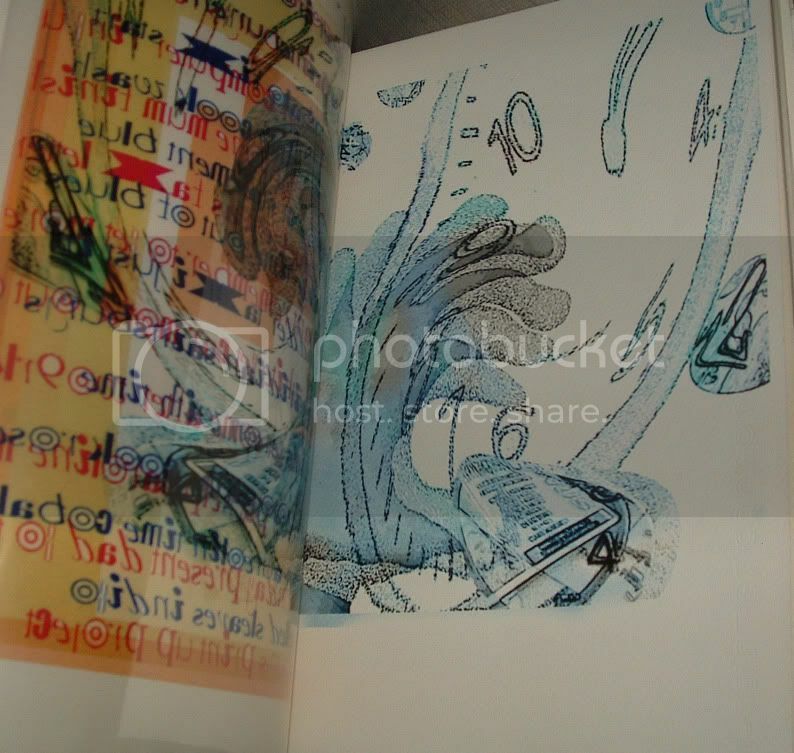 I thought I'd show you some old digital work - an artists book I made during my degree . I'd chosen a module called Integrated Imaging, which was about photography, video (I gave that a miss) and digital imagery - not that the tutors had a clue about digital imagery or photoshop! they were a painter/photographer and a film maker. I had already started using photoshop and playing with digital imagery and saw it as an ideal opportunity to explore it further. The rest of the group worked in photography or video. I was working part time, doing the degree part time and my daughters were at senior school so life was really hectic. The family were fairly understanding but sometimes there didn't seem to be enough hours in the day and I needed 6 pairs of hands to cope :( - it was always time to rush here or there, meet a deadline for an assignment, change mindset from student to employee to mum to wife. 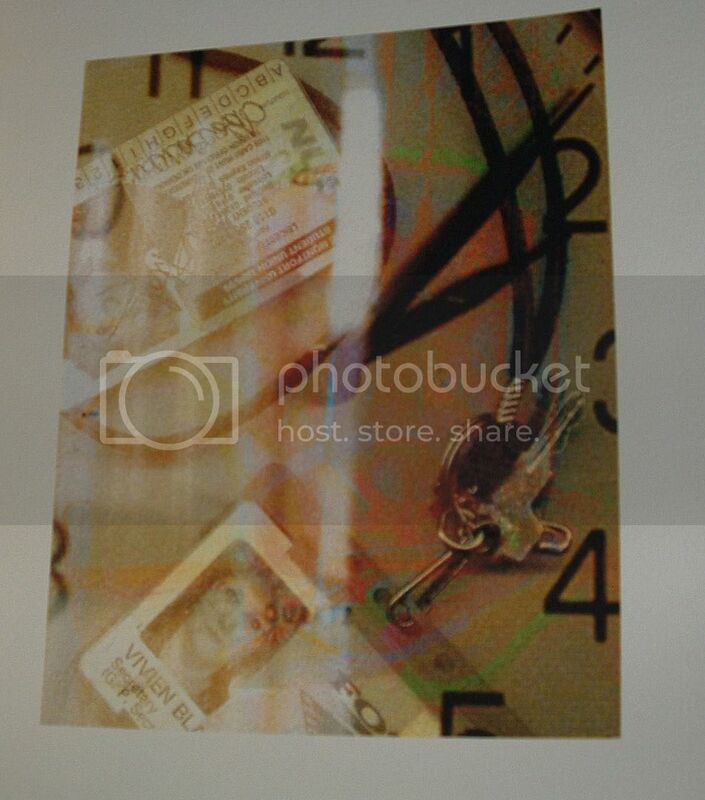 I took photographs of clocks at work and at home, scanned my hands and ID documents from work and uni, photographed the surroundings and then played in photoshop. Hands juggling and time were the key elements in my life it seemed. 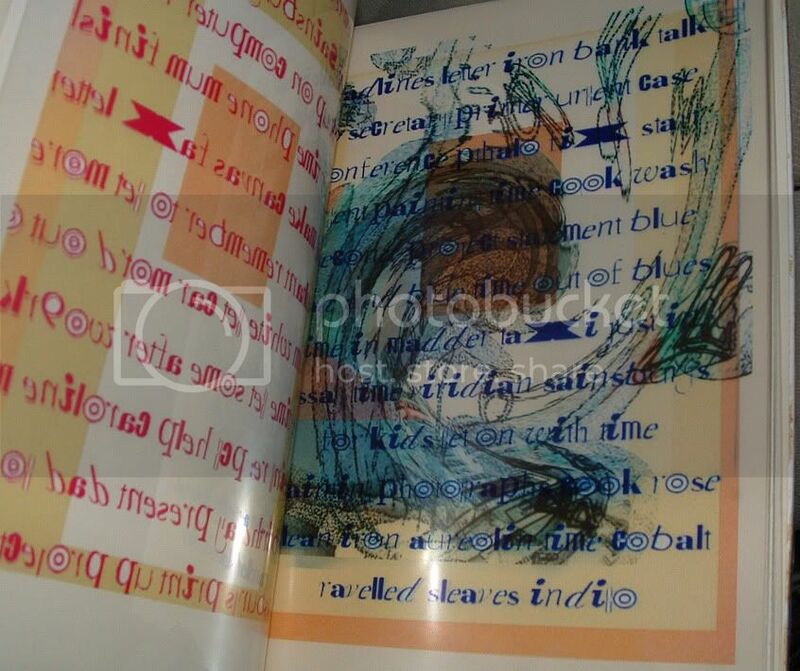 I used acetate for some pages, to layer lists of words and images so that images changed as you turned the pages, starting with 3 or 4 layers of printed acetate over a paper page, giving multiple versions as you move through the book. 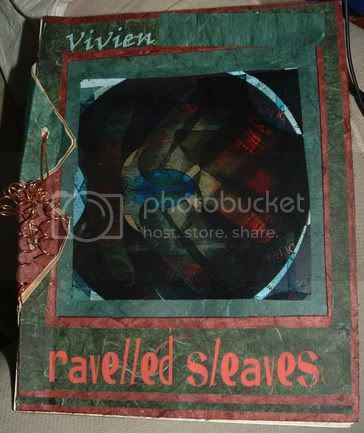 The title Ravelled Sleaves is from Shakespeares Macbeth - there's a line about Time which Knits up the Ravelled Sleave of Care - Shakespeares spelling :) it came to mind and just felt right. 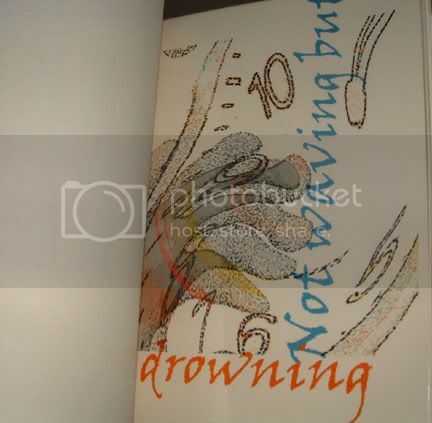 Then the poem Not Waving but Drowning by Stevie Smith - I often felt I was drowning. The actate shows lists of things to remember or do or buy - things I was juggling in my mind, trying to keep up with all of them. 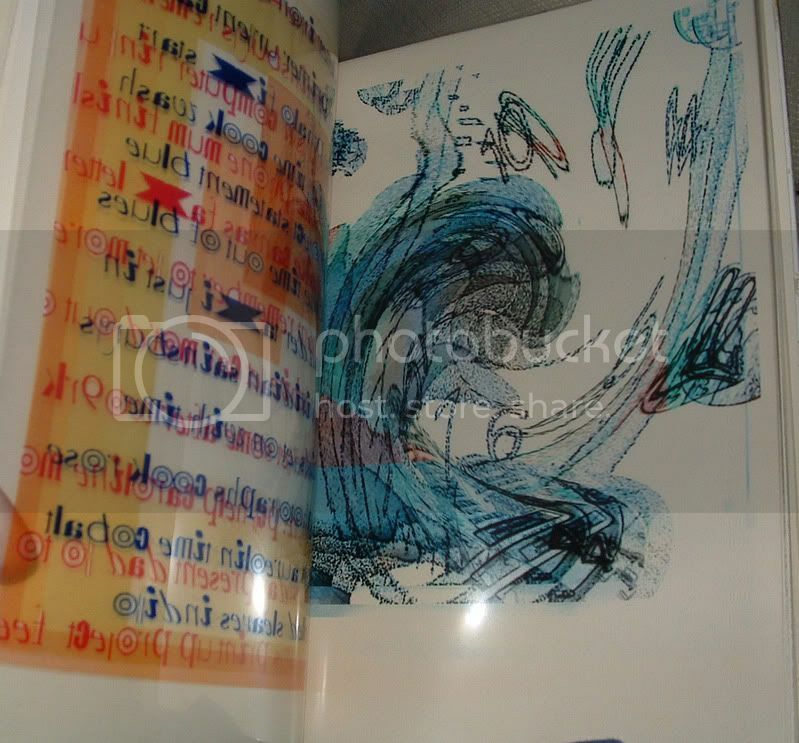 The hands and clock get steadily more and more frantic as you go through the book. It was my first attempt at making a book. I used copper wire, twisting the ends into spirals, ravelling them :) my tutors really liked the book but weren't keen on that - it came 'perilously close to Women's Institute' they said but I 'just got away with it' they decided ! The whole thing was worked out as I went along. 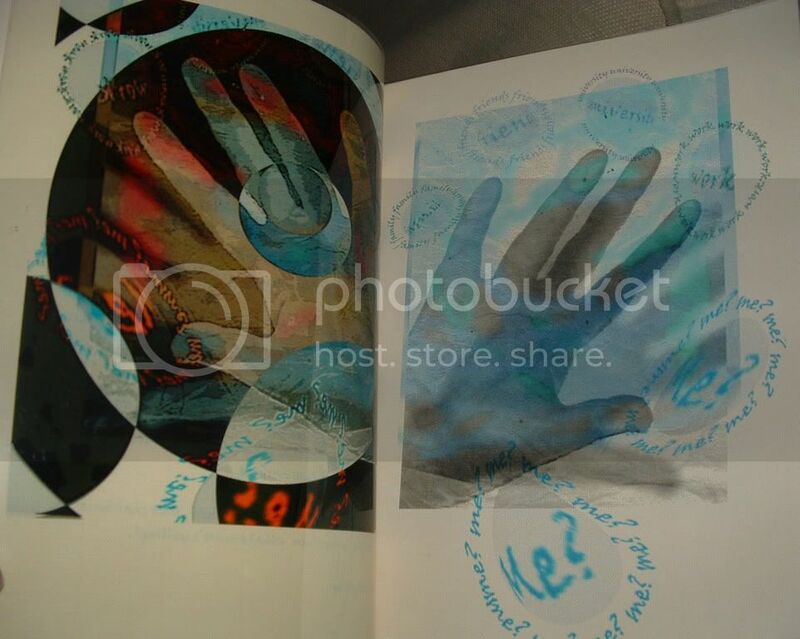 The images and 'story' came first and the idea of making a book from them later. For marking I displayed the images on the wall alongside the finished book. The method of binding evolved as I went along too - I decided to use string to bind it, simply punching holes with a file punch - that let the pages slew about too much so the idea of the wire came about and then there was a need to decide how to finish the wire off and at least partially cover the spine so the overlapping shapes evolved. 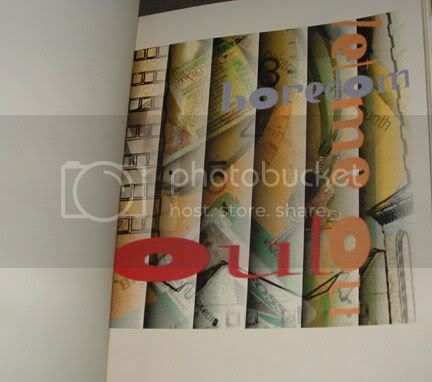 The whole project was done from photographs, scans and printed words with hand made paper, pastel paper and acetate - and of course the copper wire but no drawing or painting at all. It lives in a box now, only coming out once in a blue moon. I enjoyed using text and poetry with this project. I often enjoy the use of text by artists where it enhances the image such as the work of Kurt Jackson or Bridgette Guerzon Mills at http://bgmartjournal.blogspot.com/ maybe I should experiment with it more http://vivienb.blogspot.com/2007/04/spring.html as I did here . Do you use text in your work sometimes? I absolutely love your book. Your digital imaging is superb and I would love to see you produce another one which would be so much different now. I have bee looking at your digital work on you web site and you have a unique style which closely complements you painting style. I spend a lot of time on digital imaging and it is usually the source for my textile and fibre work. 'Spending a lot of time' however is the only drawback - it is VERY time consuming and I don't know about you but I lose all track of time when working on these images. I too like to use text a lot and often distort text to incorporate it into a design and I often free machine text over a surface. It personalises a piece even more. What exciting digital images, I love the tension and 'almost' chaos in there. I looked at all the pages on the slide show and could totally relate to your experience, having done my degree at the age of 40 something with teenage children still at home and 2 new grandchildren! (from the two who'd left home). It's weird how this drowning analogy keeps popping up with us mature students! 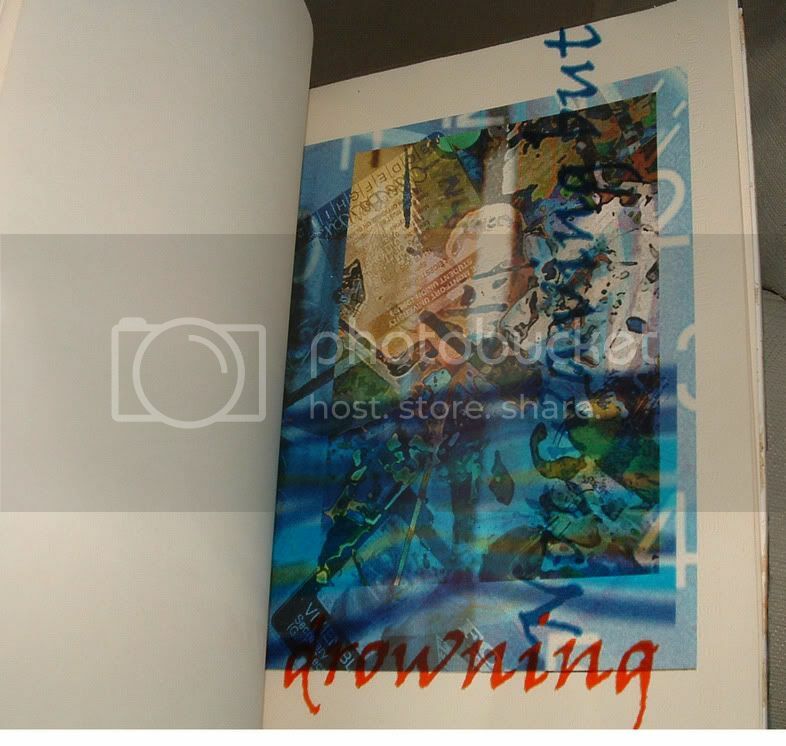 Have you thought of having the images made into a bound book . it's very cheap now , apparently Photo box do it as do Iphoto. I saw some examples of student 's sketch books copied and made into books at Graduate Fashion Week and they looked terrific. yes it is VERY time consuming i agree! and addictive - you know you should stop and get on with other things but you just want to try something else .... and a few more hours fly by! I don't see myself making it into a commercial book really - and I'm not sure that they would do the acetate pages that were a crucial part. It's just a very personal whine!!! I like using text in my work, and viewing work with text in. I find it really time consuming as I am very dyslexic - and worry about mis=spellings in the finished work! and it's blogging and forums that have taught me about slide shows and suchlike - and I'm way behind most! "Perilously close to Womens Institute" indeed! Cheeky blighters! Yes, Vivien, I do use text. And acetate.It depends what I want to convey. Dinah :D - they were capable of worse comments! I felt like having a go at another lino print yesterday and got the fish above cut. It's just a fun graphic one, stylised, no observation at all I'm afraid, unlike Jeanette, who is doing a series of gyotaku fishes. Though I did remember from wildlife programmes that fishes are often reddish underneath and silvery on top to camouflage themselves from predators. Rather than leave the lino the oblong shape, I decided to cut around the fish. This one involved applying a gradient colour in a lower layer, erasing the white background and painting colours on a layer below the fish, allowing the colours to shine through. I find that simple traditionally printed lino cuts don't suit my work so I'll use oil paint when I have time to experiment with printing this one. Then I'll be able to use a mix of colours. This is a page of watercolour studies of pansies, not intended to be 'a painting', I did a while ago that I came across. It's a grey rainy day and the light isn't good to get on with the canvasses so I decided to try to pull it together as a composition. I used a bit more watercolour and coloured pencils and cropped it and added the soft blue green background to cool it down a little - the colours felt too hot. The deep dark pansies were really velvety and intense and maybe not the colour scheme I would have set out to use with the orange and pale yellows - but the background helps to knit them together. Bringing the soft mauves into the darker flowers also helped. I also took another look at a mixed media woodland that was unfinished and worked a little more on that. It has a little oil pastel in the early stages, watercolour and then coloured pencils. We've just hung a group show at the The Eye Project, Urban/Rural show. If you want to come and see it it's on for a month - well worth seeing, 11 lovely artists and some fabulous work. Those large canvasses are 40 inches square. There are rural landscapes, flowerscapes, intriguing textile work including a large knitted building, abstracts .... something for everyone. It's in the gallery below the cafe in the Adult Education Centre at the top of Wellington street, Leicester, opposite Fenwicks. Meet the Arttists day is Saturday 1st April 10-2. Come and have a chat with us? I'm interested in painting the light and colours of landscapes as they change through seasons, the time of day or weather. Seascapes feature strongly in my work as I love the coast, a love which developed when I lived near the sea as a child in Cornwall, Scotland, Malta and Gibraltar - each place with its special light and colour. I realise too that I love the edges of things - for instance the coast, where the sea meets the land, the edges of woods where the trees meet the open fields. I paint in most media and experiment with digital imagery - as a creative process related to my painting but also creating work that exists in its own right. Another interest is photography, mainly as something in its own right, as I only rarely paint from photographs. The same elements interest me here as in my painting. Apart from painting and photography, I teach art to adults and have all the normal preoccupations, trials and tribulations of women with families ... and cats. exhibitions. illustration. design. seascapes. cornwall.